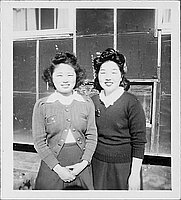 Half-portrait of two women standing side-by-side in front of tar papered barracks in Rohwer concentration camp, Rohwer, Arkansas, May 1945. 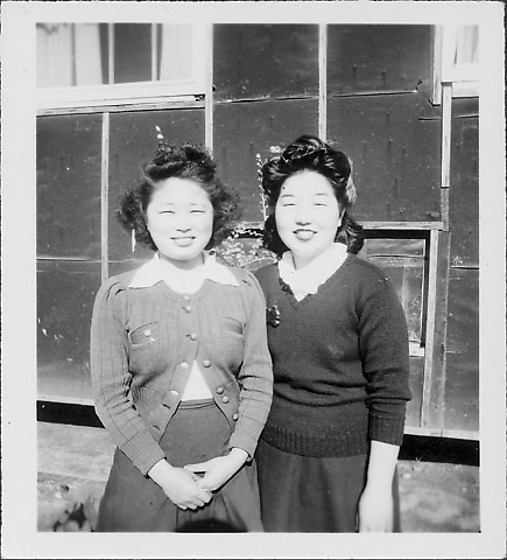 Woman on L in cardigan sweater unbuttoned at the bottom over white blouse stands with hands clasped in front of her. Woman on R wears dark V-neck sweater over white blouse with a brooch on proper R breast. Exterior wall of barracks in background. Stamped on back in black ink: MAY 1945.